Bariatric Walk-in Tub for Bathers Up to 350 Lbs. 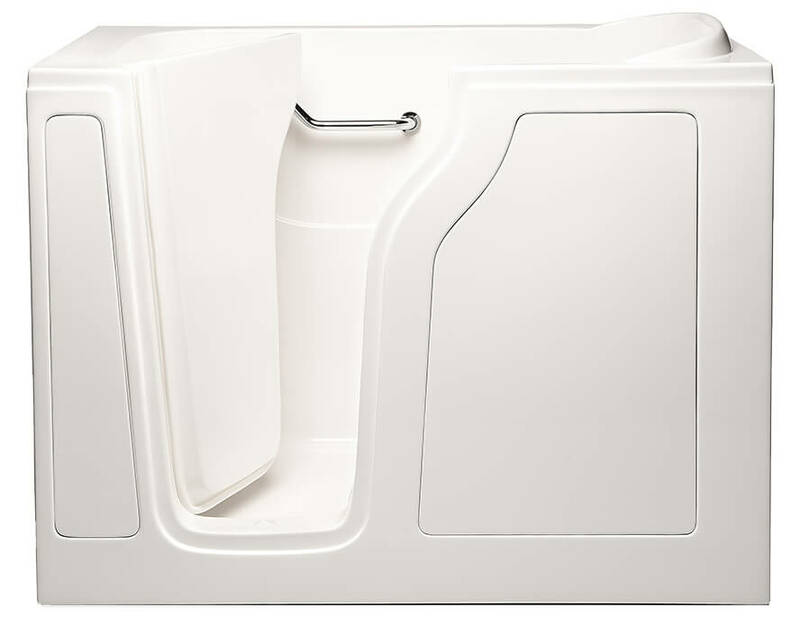 The CARE 3355 is one of our larger tubs designed for anyone looking for movability and comfort. It is made specifically for larger sized individuals weighing up to 350 lbs. Like our other designs, the CARE 3355 is constructed with your safety as our top priority. 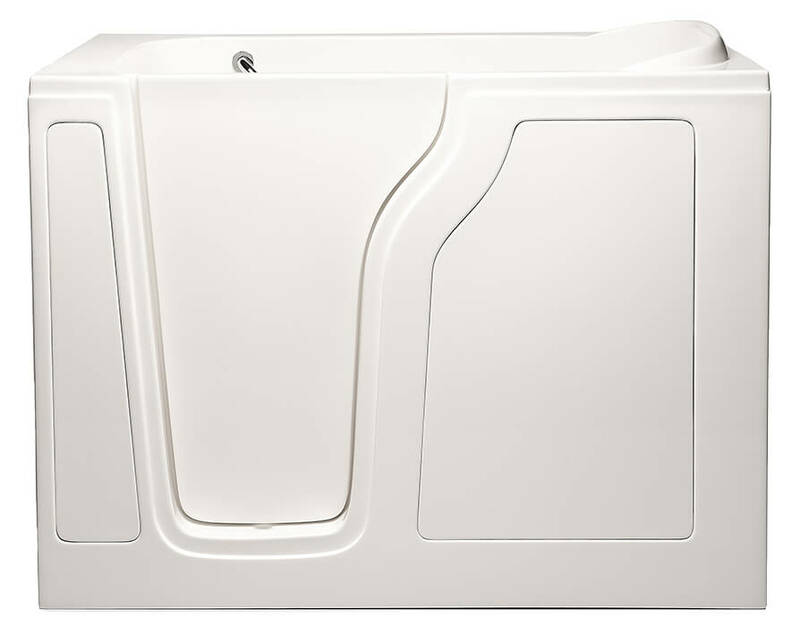 The S-shaped door allows users to enjoy easy access in and out of the tub with a wider opening at the hip area for ease of access through a 24” door opening. The water tight design of this door ensures that water will remain within the bath tub, eliminating the worry of water getting onto your bathroom floor. Statistics reveal that slips and falls in the bathroom are the top cause of injuries for the elderly, as well as being a prevalent cause of injuries for individuals of any age and mobility. The CARE 3355 comes with a fully integrated safety grab bar, and a mounted U-bar so that you can safely sit, stand, and adjust yourself inside your bath tub. The textured non-slip floor ensures that you have solid footing throughout the duration of your bath. This tub is also designed with a low, 6″ threshold and an ADA compliant 17″ high, contoured seat, so that those with a low range of movement can securely enter and exit the walk-in bath without fear. We want your bathing experience to be peaceful, relaxing, and stress free. With the CARE 3355, you get a walk-in tub that has been designed with your safety and well being in mind. We design each of our walk-in tubs to enhance your lifestyle, giving you a salubrious sanctuary where you can rejuvenate and unwind. The CARE 3355 measures at 33(W) x 55(L) x 40(H). It has ample capacity for movement and it allows you the space to adjust your water to a level that you can fully enjoy. In addition, the CARE 3355 comes with a comfortable contoured seat which is larger in size measuring at 29(W) x 17(H) x 15.5(D) and nestled ergonomically inside the tub. We understand that bathroom renovation can be a stressful experience. We have designed our walk-in tubs to eliminate this stress. The CARE 3355 is designed to replace your existing shower stall or bath tub. It comes complete with a standard 60″ wall extension kit to ensure that your new walk-in tub slots seamlessly into your bathroom’s floor plan. We offer a flangeless design with your CARE 3355 to ensure that you can preserve your current tile work. This also helps to cut the duration and cost of your installation, which is always a desirable incentive. If needed, we offer an adaptable tile flange kit for your convenience. We at American Tubs look forward to providing you with the most comfortable and highest quality walk-in tub on the market. Quality is an essential tenet at American Tubs. We endeavor to provide you with the highest quality materials in the construction of your walk-in tub. The CARE 3355 is constructed with a one-piece stainless steel frame made of woven marine-grade fiberglass, which means that your walk-in tub is crafted with the strongest fiber glass on the market. This gives our product an edge over other walk-in tub companies who manufacture their walk-in tubs with lower quality acrylic and/or plastic. We coat your CARE 3355 with a triple gel coat finish which is not only extremely durable, but it also makes your bath tub easy to clean. Our walk-in tubs can be ordered in either biscuit or white: colors that match virtually any existing bathroom décor. With 6 adjustable, levelling legs, your walk-in tub can be modified to a level that is perfect for you. When you invest in a CARE 3355, you are investing in the highest quality walk-in tub on the market. Each of our walk-in tubs comes with practical yet elegant fittings to make your bath time care free and enjoyable. Enjoy our 5 piece chrome plated faucet set with solid brass construction. The hot and cold water handles are complemented by an easy to use and convenient diverter handle so that you can adjust your water to a temperature that is just right for you. You may also appreciate the hand-held shower nozzle which gives you the option of both bathing and/or showering. Each of our tubs comes with a standard 1.5″ drain; however, we also provide the option of a secondary toe drain and a specially designed 2″ hurry drain which allows your water to drain in under 110 seconds depending on your water level and the efficiency of your household plumbing. We also offer an optional Speedy fill 3/4″ inch faucet which can fit onto your existing 1/2″ household piping to allow your bathtub to fill up more quickly. We are always thinking of new ways to make your bathing experience more enjoyable and relaxing. We are optimistic that you will appreciate the design and practicality of your walk-in tubs’ fittings. Indulge in the rest and luxury of your bath time with our customizable options. Our Hydromassage System has been explicitly designed to target key areas of your body where the stress and strain of life seem to reside. 6 powerful jets in a V-shaped configuration deliver a rigorous kneading to the muscles in your shoulders as well as your mid to lower back. 2 more hydro jets are located at your legs to stimulate your calves with 2 more jets at the bottom of your tub to work on the bottom of your feet. Many of our customer testimonials attest to the therapeutic benefits of this spa-like treatment. For a lighter massage which stimulates circulation and exfoliates the skin, you would love our Air Massage System which features hundreds of air bubble streams which work their way through 20 strategically located jets, revitalizing the joints in your legs, hips, feet, ankles, and back. You can also opt for the wonderful, therapeutic benefits of our Chromatherapy and Aromatherapy options. Respectively, these systems harness the healing effects of both light and scent to promote healing physically, mentally, and spiritually. You can enjoy these options collectively or separately. We have several more optional, customizable features to choose from as well. Visit our features page to learn more. We very much look forward to working with you to create a blissful, invigorating, and salubrious bathing experience that will enliven your quality of living.